Andargachew Tsege — known to his friends as Andy — is a British citizen currently on death row in Ethiopia for allegedly plotting a coup and planning to kill Ethiopian officials as part of his leadership of the Ginbot 7 opposition movement. Earlier this month a new VIDEO featuring Tsege was released, representing the first time his family have seen him since the last footage was broadcast, six months ago. Tsege’s lawyer Maya Foa, who is head of the death penalty team at the legal charity Reprieve, told VICE News that the video is “a naked attempt to counter allegations that Andy is being tortured.” Its release places more pressure on the British government, which CONTINUES to stand accused of not doing enough to help its citizen. Tsege was born in Ethiopia but left in 1979 and given citizenship in Britain. Following the overthrow of the brutal Derg regime in 1991, he RETURNED briefly to his homeland, before exposing corruption in the new government of then-president Meles Zenawi, before being again driven out of his country back to the UK. In 2009, he was sentenced to death, in absentia, by the Ethiopian authorities, which accuse him and the banned Ginbot 7 movement of being terrorists. LAST June, Tsege was seized by Ethiopian agents in Yemen and taken to Ethiopia, where he has been in a secret detention facility ever since. While he’s unlikely to face a rarely imposed death sentence, he is on death row and the charges against him are being brought. When Tsege does appear, he says that “this is a different era,” in which opposition movements can express their beliefs freely. He tells the viewer that he is being treated well: “I have really become healthy since I came here. Physically I am so perfectly healthy — absolutely. I’m so thin; there are no bumps anywhere… To tell you the truth there are lots of things I have come to appreciate,” he says. 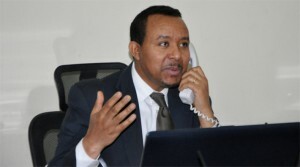 His partner of ten years, Yemi Hailemariam, with whom he is bringing up three children, believes he is speaking UNDER duress. Ethiopia has been a key long-term regional ally for the US and the UK. A large country in the Horn of Africa, it has been an ACTIVE supporter of the War on Terror — taking on al Shabaab in Somalia and jailing suspected Al Qaeda militants — as well as adapting British and American anti-terror legislation and using it to crack down on opposition groups and civil society. In the past year, a wide variety of journalists been arrested on very tenuous grounds. As well as Ginbot 7 and others, separatist rebel groups the Ogaden National Liberation Front and the Oromo Liberation Front have been declared terrorist organizations. Ethiopia’s development model, which borrows from China, puts alleviating poverty through very tight state control first and has little time for the freedoms that Western democracies purport to CHAMPION . There are some indicators of success for this model. The country’s GDP has gone from $12.4 billion in 2005 to $47.5 billion in 2013, according to the World Bank. And while the British government has expressed its concern with Ethiopia’s human rights record, it CONTINUES to support the country politically and financially. Ethiopia is a priority for the UK’s Department for International Development (DFID), which spent £261.5 million on the country — its biggest program — between 2012 and 2013. Tsege’s case, then, is a headache for the British government. Addis Ababa has only allowed him to be visited by the British Ambassador twice — the last time on December 19. “We CONTINUE to press the Ethiopian authorities at the highest levels regarding both Andargachew’s treatment and the need to follow due legal process. We strongly oppose the death penalty in his as in all cases,” a British foreign office spokesperson said. Nevertheless, the Foreign Secretary Philip Hammond has not called his counterpart to discuss the case. Internal foreign office EMAILS leaked to the MAIL on Sunday revealed that officials were exasperated with Hammond for not finding the time to make a call and not WANTING TO write a “negative” letter. Foa shares this exasperation. “It is clear that those working for the Foreign Secretary know how perilous the situation is for Tsege,” she told VICE News. “They know that Andy has committed no crime, that his extradition was probably unlawful, and that there are grave risks to his safety. What’s shocking is that the Foreign Secretary appears time and time AGAIN to have blocked any meaningful action that could potentially bring this British father home to his family, unharmed. How many political bloggers need to be imprisoned before the US reacts? Read more here. “Andy has now been held in solitary and incommunicado detention for over seven months, under sentence of death. One has to QUESTION what interests the Foreign Secretary is putting above the life and safety of his citizen, when all those around him are calling for him to do more,” she says. It remains very unlikely that a death sentence will be carried out but little progress appears to have been made in the case. The Swedish journalist Martin Schibbye, who was held in an Ethiopian prison for 14 months, told VICE News that, based on his experience listening to the screams of opposition members, he was very confident Tsege was being tortured. A source in the Ethiopian foreign ministry suggested that if Tsege asks for a pardon, his death sentence would be commuted to a life sentence in prison. This in turn would allow for a presidential pardon later — something that could eventually lead to Tsege being released from jail. But while Mulatu Teshome, Ethiopia’s president, has been MORE prominent than previous holders of the position and will have views of his own on the case, there is very little concrete evidence Tsege can currently hold on to as grounds for hope. የገዢውን ፓርቲና መንግስትን ሽፍትነት ያጋለጠው አንድነትን የማፍረስ የምርጫ ቦርድ ውሳኔ በኢትዮጵያዊን ዘንድ ተቀባይነት አይኖረውም!!! 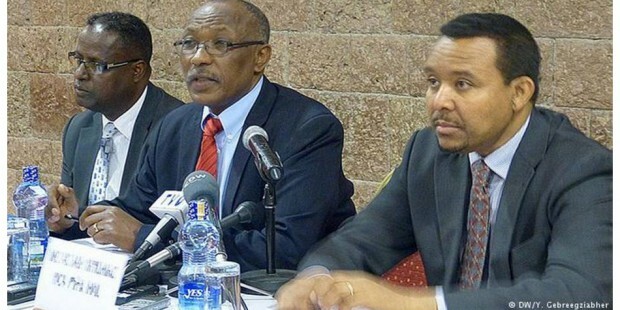 Over the course of the week of January 7, the National Electoral Board of Ethiopia (NEB) hammered what appear to be the final nails in the coffin of the opposition Coalition for Unity and Democracy (CUD) party. Since their surprise showing in the 2005 elections, gaining enough seats to become the second largest political party in Ethiopia, the CUD has virtually disintegrated as a result of internal power struggles and interference from the Ethiopian Government (GoE). In the latest setback, the NEB awarded the famous victory sign — the CUD symbol widely recognized by voters — to former ally turned foe, Lidetu Ayalew of the United Ethiopian Democratic Party-Medhin (UEDP-Medhin). The NEB followed this later in the week by finally awarding REGISTRATION of the reformed Coalition for Unity and Democracy Party (CUDP) party name to yet another former CUD ally turned foe Addis Ababa city council member-elect Ayele Chamisso. Though Ayele, who is broadly viewed as having been co-opt by the GoE, has invited all faction of the former CUD to join his party, few will likely take his offer. In a meeting with Ambassador on January 11, NEB board chairman Dr. Merga Bekana and vice-chairman Dr. Addisu Gebre-Egziabhier said THAT the Board still had not decided on the CUDP’s REGISTRATION and would continue to consider the matter in coming weeks. Almost immediately following the meeting, however, the NEB publicly announced that it had decided that morning to award the party license to Ayele. This followed their controversial decision earlier in the week to give the CUD’s famous victory symbol to the CUD’s despised adversary Lidetu Ayalew (another person believed to have been co-opted by the GoE during the CUD’s post-2005 election struggles), and his UEDP-Medhin party. The opposition fiercely accused the NEB of being under the influence of the GoE and of delivering votes to the ruling Ethiopian Peoples Revolutionary Democratic Forces (EPRDF) party after the opposition’s surprisingly strong showing. Since then, a new Board has been put in place, but the opposition have not altered their criticism. The NEB’s recent decisions to award the CUD party symbol and name to politicians, who are at best undeserved and at worst proxies of the GoE, has done much to reignite lingering suspicions regarding the NEB’s independence. As if to prove these suspicions, NEB vice-chairman Dr. Addisu (a Tigrayan political scientist widely believed to be the “enforcer” at the NEB) recently commented to USAID’s Senior Democracy Advisor — a former Stanford University Political Science Professor ) (strictly protect) that the NEB had decided to “kill the CUD.” The NEB decisions of the last week have effectively done exactly that. በጃኑዋሪ 7 ሳምንት ወቅት የኢትዮጵያ ብሔራዊ የምርጫ ቦርድ በቅንጅት ለአንድነትና ለዲሞክራሲ (ቅንጅት) ፓርቲ የሬሣ ሳጥን ላይ የመጨረሻ የሚባለውን ሚስማር መትቷል፡፡ በ2005 (1997) ምርጫ በአገሪቱ ሁለተኛው ትልቁ የተቃዋሚ ፓርቲ ለመሆን የሚያስችለውን አስደናቂ ድልና በቂ መቀመጫ ካገኘ በኋላ ቅንጅት በውስጡ በነበረው የኃይል (የሥልጣን) ሽኩቻና ከኢትዮጵያ መንግሥት በኩል ይደርስበት በነበረው ጣልቃ ገብነት ምክንያት አለሁ ቢልም እየተፈረካከሰ ነበር፡፡ በቅርቡ በተደቀነበት ሌላ ደንቃራ ደግሞ ምርጫ ቦርድ ዝነኛውንና በብዙሃን መራጭ ዘንድ ዕውቅና የነበረውን የቅንጅትን (V) ምልክት ቀድሞ (የቅንጅት) ወዳጅ በኋላ ጠላት ለሆነው የኢትዮጵያ ዴሞክራቲክ ፓርቲ – ኢዴፓ-መድህን ልደቱ አያሌው ሸልሞታል፡፡ በመቀጠልም ምርጫ ቦርድ ይህንን ተከትሎ የቅንጅት ለአንድነትና ለዴሞክራሲ ፓርቲ የስም ምዝገባ ቀድሞ የቅንጅት ወዳጅ በኋላ ጠላት ለሆነው የአዲስ አበባ ምክርቤት እጩ ተመራጭ አየለ ጫሚሶ ሸልሞታል፡፡ የኢትዮጵያ መንግሥት ቅጥረኛ እንደሆነ በሰፊው የሚታመነው አየለ ጫሚሶ ከቀድሞው ቅንጅት ተሸራርፈው ለወጡት ሁሉ የእርሱን ፓርቲ እንዲቀላቀሉ ጥሪ ቢደርግም ጥቂቶች ብቻ ጥሪውን ይቀበላሉ ተብሎ ይጠበቃል፡፡ . . .
የምርጫ ቦርድ ሊቀመንበር ዶ/ር መርጋ በቃና እና ምክትል ሊቀመንበሩ ዶ/ር አዲሱ ገብረእግዚአብሔርከአምባሳደሩ (ያማሞቶ) ጋር ጃኑዋሪ 11 ቀን ባደረጉት ስብሰባ የቅንጅትን ምዝገባ በተመለከተ ገና ውሳኔ ላይ እንዳልደረሱ እና በመጪዎቹ ሳምንታት ጉዳዩን እንደሚመለከቱት ነበር የተናገሩት፡፡ ነገር ግን ወዲያውኑ ስብሰባው እንዳበቃ ማለት ይቻላል የዚያኑ ቀን ጠዋት የቅንጅትን የስም ምዝገባ ለአየለ ለመስጠት መወሰኑን ምርጫ ቦርድ ለሕዝብ ይፋ አደረገ፡፡ ይህ የቦርዱ ውሳኔ በሳምንቱ መጀመሪያ አካባቢ የቅንጅትን ዝነኛ (V) ምልክት በቅንጅቶች ለተናቀውና የፓርቲው ጠላት ለሆነው ልደቱ አያሌውና ለኢዴፓ-መድህን ፓርቲው ለመሸለም የተደረገውን አከራካሪ ውሳኔ ተከትሎ ነው፡፡ (ልደቱ አያሌው ከምርጫ 1997 በኋላ ቅንጅት ውስጥ በነበረው ትግል ውስጥ በኢትዮጵያ መንግሥት የተመደበ ሌላው ቅጥረኛ እንደሆነ ይታመናል)፡፡ . . .
አሁንስ ማነው ባለሳምንት? በዚህኛው የምርጫ ድራማ አየለ ጫሚሶን የሚጫወተው ትዕግስቱ አወል እንደሆነ ይፋ ሆኗል፤ ልደቱንስ ማን ይተውነዋል? እግዚኦ! መጥኔ ለእኛ ፖለቲካ፡- ስለ ኢትዮጵያችን ሰላም፣ ስለ ፍትሕ፣ ስለ እውነት በአንድነት ድምፃችን ይሰማ! አብዝተን እንጩኽ …! እናም በእናት ምድር ሰማይ ላይ አንዳንች መዓትን ያረገዘ የሚመስል የጥፋት፣ የእልቂት ደመና እያንዣበበ ነው፡፡ ይኸው ምርጫ የሚሉት ነገር በደጅም አይደል፤ እዚህም እዚያም ቤት ጩኸት በርክቷል፡፡ መወነጃጀሉ፣ መወራረፉ፣ በነገር ጅራፍ መገራረፉ፣ መዠላለጡ አይሏል፣ በርትቷል፡፡ አዲስ የብሔራዊ መግባባት መንፈስና የዲሞክራሲያዊ አንድነት መንፈስን የተላበሰ ከመንደር፣ ከወንዝ የሚያልፍ አገራዊ አስተሳሰብን ለመውለድም ሆነ ለማዋለዱ ምጡ በርትቶብናል፣ ወይንም አልተቻለንም!! እናም የሃይማኖት አባቶችና መሪዎች፣ አገር ሽማግሌዎች፣ የፖለቲካ አመራሮች- ሁላችን አገራችን የምንወድ፣ ሕዝባችንን የምናፈቅርና ለወገኖቻችን የምንቆረቆር ሁሉ የሠጋነውና የፈራነው ነገር እንዳያገኘን፣ የፊታችን የግንቦቱ ምርጫ በእውነትም ምርጫ እንዲሆን፣ በኢትዮጵያችን ምድር ሰላም አብዝቶ እንዲሰፍን፣ ስለ ሰላም ዘብ የሚቆሙ የሰላም ጠበቃዎች፣ የሰላም ሐዋርያዎች ከፍ ከፍ እንዲሉ ሁላችንም አብዝተን እንጩኽ፣ ድምፃችንን ደጋግመን እናሰማ- ስለ ኢትዮጵያችን ሰላም፣ ስለ ፍትሕ፣ ስለ እውነት! !